That was the reaction of every US soccer fan when the United States was drawn into group G along with powerhouse Germany, Portugal and CR7, and their World Cup kyrptonite, Ghana. To make it worse, the US were to play in the Amazon jungle in Manaus, and they would have among the most grueling travel schedule of the 32 teams… Things looked grim for the US. Many of my friends did not believe there was even a shot for the Yanks… “We maybe have a shot against Ghana, but they’ve had our number!”…. “There’s just no way we can stop Ronaldo! Who’s going to stop him? Honestly?”…. “Germany… are you kidding?”…. 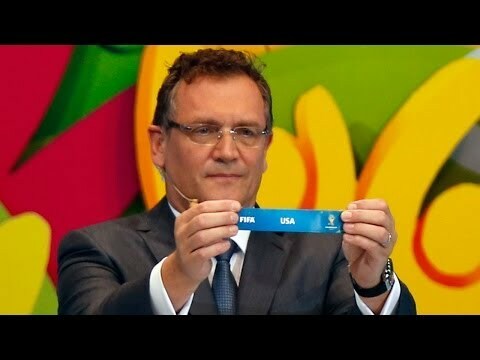 I had these conversations countless times the days following the World Cup drawing, and the conclusion everyone had come to was that we could get out of the Group of Death…. but we would need a small miracle. Wondolowski!!!!! 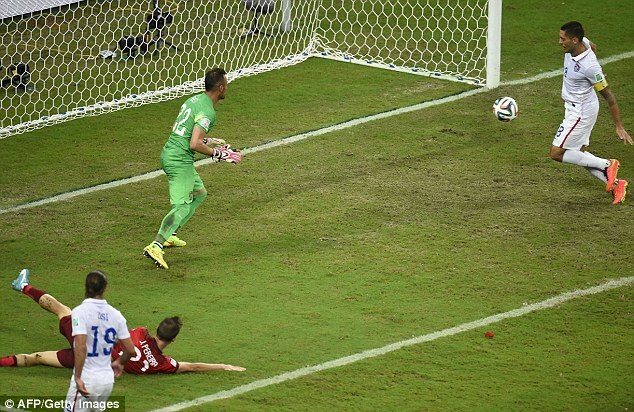 It’s Wondolowski in only the 7th minute to put the United States ahead for the first time in 2014. It’s a beautiful cross from Graham Zusi, a better run from Brad Davis, and a brilliant finish from Wondolowski- simply being in the right place at the right time! Beautiful football. A wonderful way to start the World Cup build-up with two goals from the poacher, Wondolowski, and a 2-0 win over Korea. Four months until the World Cup. Thoughts from a fan: Promising… Promising… and they weren’t even playing with Michael Bradley, Tim Howard or Clint Dempsey… Is there a glimmer of hope…? “Zusi with the corner…. Br-BRADLEY!!! He’s scored with a magnificent run to the back post! THE US ARE ON TOP!! !” Exactly what the Americans wanted, but they were far from done. “Another ball played in…. Br-Bradley’s there again! WONDOLOWSKI!!! HE’S SCORED IT! THE US HAVE GONE UP ANOTHER!” Incredible. Could not be going better! Exactly what we needed!… Well.. almost. El Tri went on to equalize in the second half which saw the likes of Landon Donovan and a, mostly ineffective, Julian Green. The US conceded from a set piece off of Rafael Marquez’s head as well as a defensive laps after a Romando save… Things were starting to look up for the Yanks… people were starting to get excited… people started talking about “That US Soccer team…” Two months until the World Cup. Klinsmann names final 23-man World Cup roster. Among the 23 named are Seattle Sounders’ defender, DeAndre Yedlin, who had yet to play a game for the US, as well as Bayern Munich (3rd Team) German-American Julian Green. Yet, the biggest surprise of the roster was that the all-time leading American goal-scorer and the player who willed the US to the knockout stage in 2010, was left off the roster. 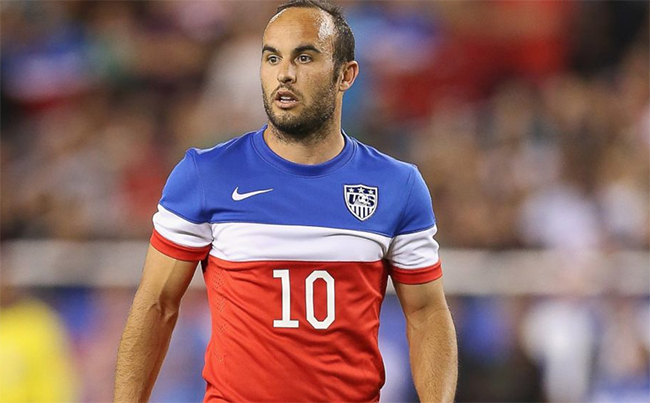 Landon Donovan would not be traveling with the USMNT to the Brazil in 2014. The soccer world was shocked…. and so was Landon. Landon Donovan cut from final 23-man roster. Shocked… HOW. CAN. YOU. LEAVE. HIM. OFF. THE ROSTER!!!! You’re killing me Klinsmann! But I believe in you…. Godspeed, Jurgen. 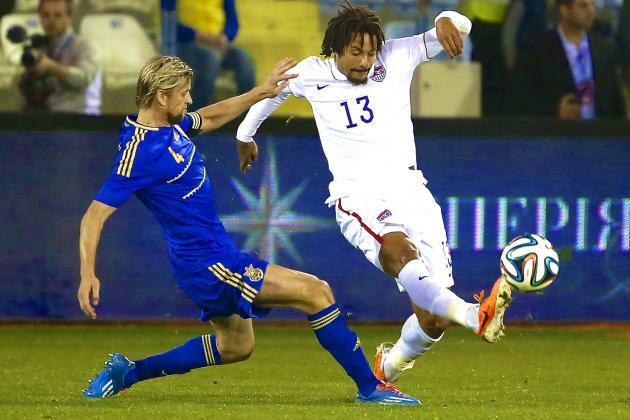 The US kicked off the send-off series in San Francisco against Azerbaijan. They could feel the pressure building… The fans were divided over the Landon Donovan debate and now everyone was watching to see how THIS 23 would react… And oh they responded. Although it was late, the Klinsmann substitutes (not Donovan…) responded with goals from Mix Diskerud first then the Iceman, Aron Johannsson. The US were able to secure and maintain a 2-0 lead. The other talking point was Jozy Altidore. 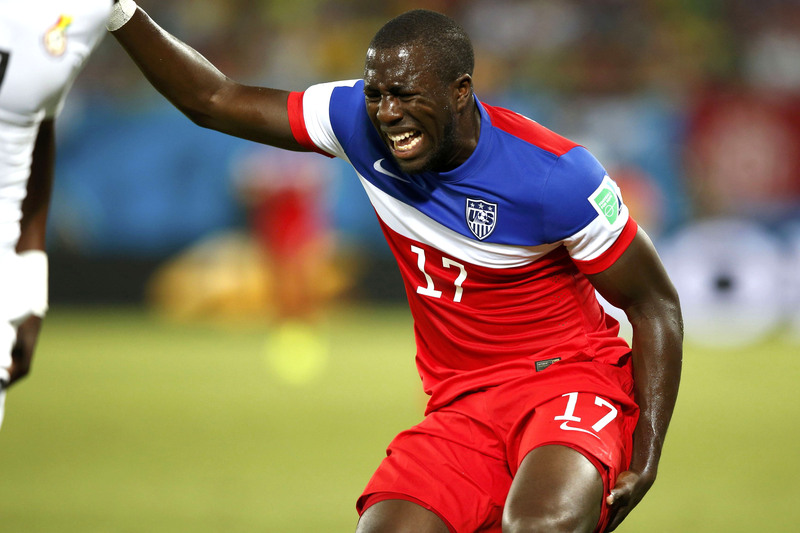 Although Altidore did not score, he looked… kind of dangerous… but he needed a goal having failed to score since December of 2013 and the World Cup just weeks away. Encouragingly, the biggest question mark for the US, the defense, looked fairly strong… Howard was solid in goal and Besler and Gonzalez allowed few opportunities for the opponents. They had come a long way since the 0-2 defeat against Ukraine but everyone knew that they were going to have to be better if they wanted a chance at advancing in Brazil. But regardless… People were paying attention. 20 days until first game. I see you, Iceman. Mix, your still crazy but I love you. Do we have a chance here?! I’m still very skeptical but… never say never. The world was beginning to catch World Cup fever (a deadly disease, I might add), and it was the Yank’s time to show them that they were worth watching in their second match of the send-off series against Turkey. And, oh what a show did they put on. The first goal was the most beautiful goal the Americans had scored in a long time. Fabian Johnson played a ball to Bradley, then Bradley brilliantly lofted the ball over the back line of Turkey to be pounded into the back of the net off a one time finish from a streaking Fabian Johnson. It was a world class ball and a world class finish. 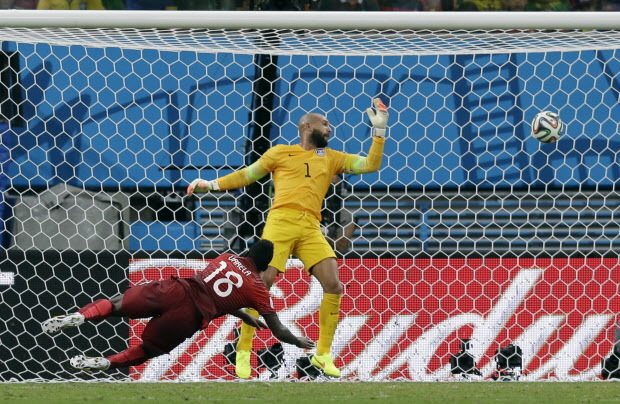 Again, Altidore could not find the back of the net but Dempsey poked one in off a goalie miscue in the second half. Things seemed to be looking up for the Yanks, who won their second consecutive match 2-0 over Turkey. Just 15 days before their first game. 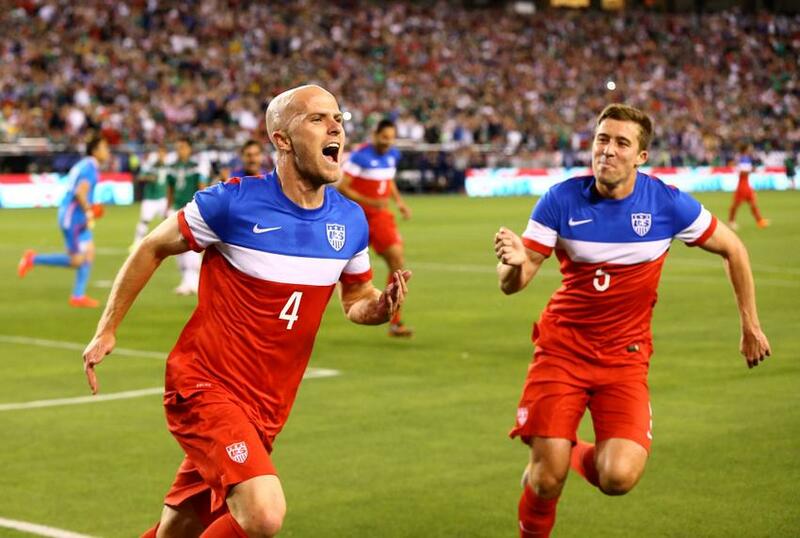 Michael Bradley, Fabian Johnson, I love you. That was amazing. I believe. In Florida, for their final game of the send-off series, the Yanks faced a fesity Nigerian team under the humid Jacksonville sky. A climate that the Yanks would have to start getting used to for their matches in Brazil. The Americans started the same 11 that would eventually start against Ghana so this match was the “real” American squad. This was the team the US would be working with, and, to be honest, they looked like a formidable squad. Scoring in the 31st minute off a combination play that ended with Fabian Johnson slicing a ball across the box that met Jozy Altidore’s foot and eventually the back of the net! Exactly what Jozy wanted, but he wasn’t done… Not long after, Bradley played another ball over the top to Altidore who chested it down, cut with his left and hammered the ball past the near post and into the back of the net! An absolutely marvelous goal from, what seemed to be, a world class striker! Could this be a sign! 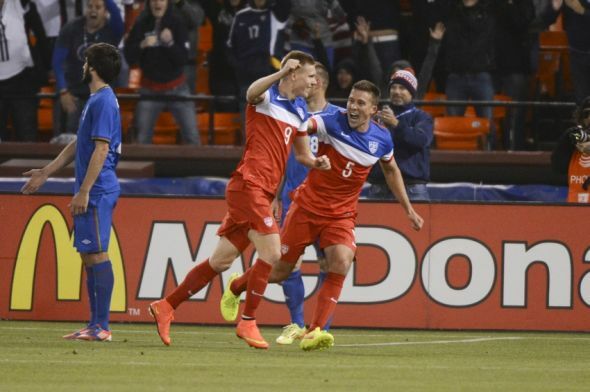 A healthy Jozy is the missing puzzle piece…. and he is showing up! Wow! The American defense followed up the two goals from Altidore with a clean sheet finishing up the game two goals to nill. The Americans had now won three in a row. Now… the Nation is watching… 9 days before the first game. Wow. That was exactly what we needed! 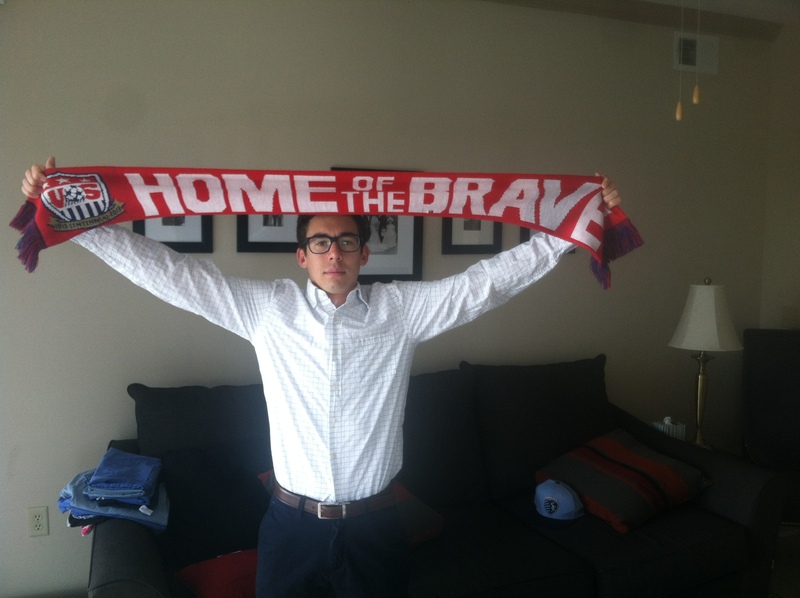 Jozy finally has the monkey off his back… the team looks good! The defense looks passable… we might actually have a chance. Ok… deep breaths. Still over a week to go…. time to pray. I woke up. Tired. Barley slept. Couldn’t think about anything but The Game. 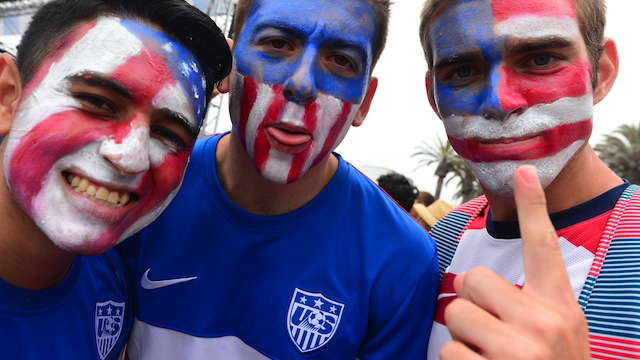 It wasn’t the knockout stage, but everyone knew it was a win-or-go-home mentality for the US today. I was thinking about it all night. Have to focus though. Time to work (I dawn my USA scarf and leave). About to head to work… Game Day. Dempsey… Great start here… C-Can CLINT DEMPSEY!!! CAN CLINT DEMPSEY SCORE?! HE HAS!!! HE HAS PUT THE AMERICANS AHEAD!!! INCREDIBLY! WITHIN SECONDS! This is absolute Dreamland. 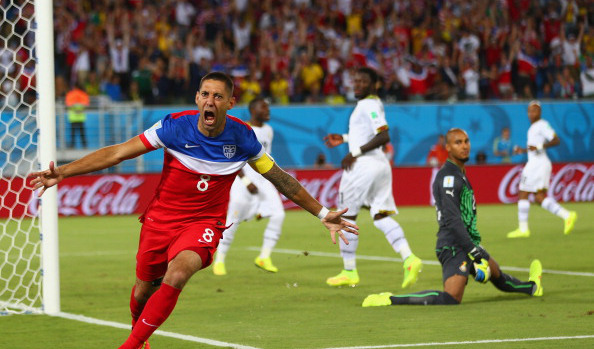 Dempsey after scoring a goal just seconds into the start of the World Cup. And yes it was Dreamland. A perfect start to the World Cup for the Americans… but that was, well, one of only two positive things that happened for the US in that game. In the 20th minute, Bradley played a ball over the top for Altidore when tragedy struck… Altidore stopped mid-run, grabbed his left hamstring, went to the ground and immediately called for the medical staff to come on the field. His World Cup was over and it had only just started. 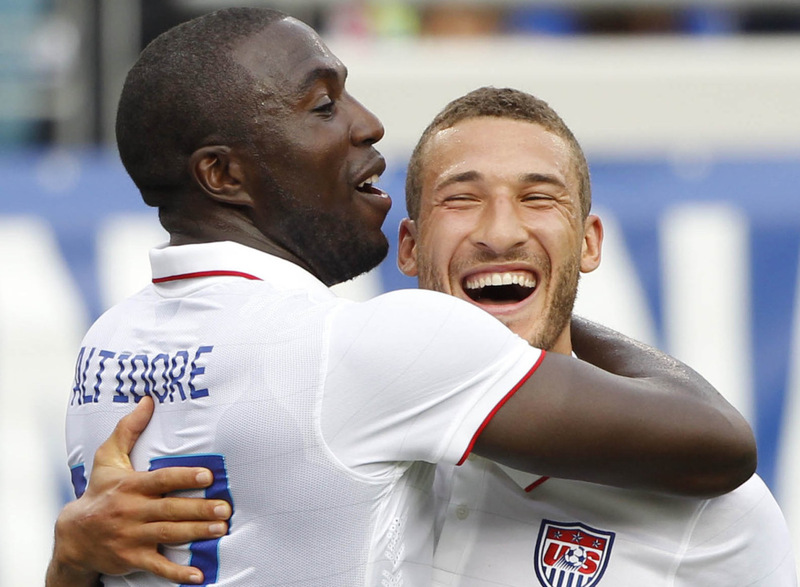 The true potential of Jozy Altidore would not be realized… at least not in Brazil. For the next 60 minutes the Americans defended valiantly but in the 82nd, off a back heel assist from Asomoah Gyan, the Black Stars scored the equalizer to end all American hopes and dreams of advancing… For if they did not score in the next 10 minutes, they would need a win against either Portugal or Germany for any chance of advancing to the knockout stage… And things looked pretty grim for the Yanks. They had been defending like mad for the entire game and now they needed a goal… minutes later a young man named John Brooks game on as a substitute for an injured Matt Besler… a few minutes later he made history. Scoring a goal off a Graham Zusi corner in the 86th minute to put the Americans ahead with a few minutes left in the game! It was absolute mayhem in Kansas City and mayhem across the US as everyone celebrated the USA victory! Oh did things look good for the Americans! A 2-1 win for the US was the absolute best thing Klinsmann could ask of his team and they were poised to make the knockout round after Portugal were defeated 4-0 in their first game against Germany. They were in prime position and the entire nation was watching! Their fate was in their own hands. John Brooks scores the go-ahead goal off a Zusi corner in the 86th minute. A goal that will always be remembered in US soccer history. I BELIEVE THAT WE WILL WIN! I BELIEVE THAT WE WILL WIN! I BELIEVE THAT WE WILL WIN! Ya, 6 months ago we would have been happy with a point after a game against Cr7… but WE. WEREN’T. SATISFIED! 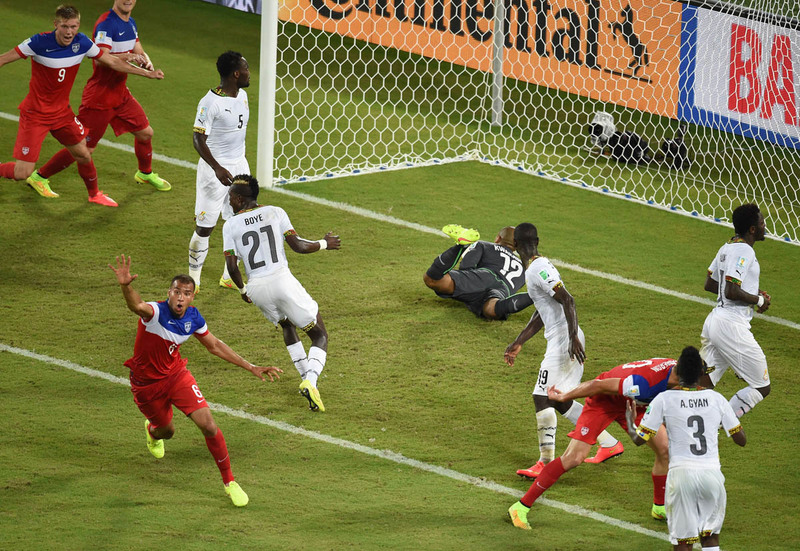 And in the 81st minute it was (who else) but Clint Dempsey off a Graham Zusi cross to put the US ahead!!! 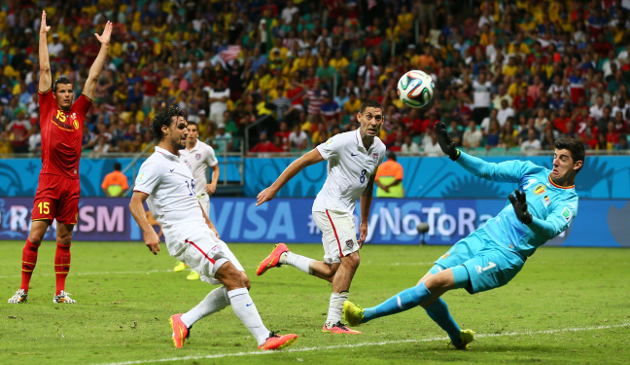 Clint Dempsey scores to put the US ahead 2-1 against Portugal late in the game. Just 10 minutes and we would be headed to the knockout round with two wins in two games in the Group of Death! Who would have thought! Fast forward. 94th minute. I’ve got my phone out ready to record the scene at Power and Light District in Kansas City as the crowd erupts and celebrates the passage of the US onto the knockout round. I wasn’t the only one either… There were over 20 million Americans watching (more than any NBA Final playoff game this year), and we were all ready to celebrate our entrance into the round of 16. There were two people who had other plans… Cristiano Ronaldo and Silvestre Varela. With just seconds left in the match Michael Bradley coughed up the ball in the middle of the field which allowed Cr7 to whip a ball in with just 30 seconds left that found Valera’s head and reached the back of the net without giving Tim Howard a chance… No one could believe it…. We were so close. And you know who’s fault was it?… Michael Bradley. Oh how he had fallen after scoring and dishing out an assist against Mexico in April… There always has to be a scapegoat and, justified or not, Michael Bradley was that man. Nonetheless the US had four points going into their final match with Germany and needed just one point to finalize their spot in the next round. So close. Valera scores off a Ronaldo cross in the 94th minute to equalize and keep Portuguese hopes alive. How do you lose the ball with 30 seconds left in the game?!?!?! Come on, Michael! You could have done anything but that!!!! So close. A tie and we advance. That’s it. And it seemed to be going well for the US until Mueller found the back of the net in the 55th minute. That’s when it all seemed to turn for the Yanks. Hundreds of miles away the Black Stars had equalized against Portugal and were threatening to score again…. I’m not going to get into the details but if Ghana had scored one more goal and won the game 2-1 the US would have been eliminated on the SECOND tie breaker. They would have been eliminated for the third consecutive World Cup by the Black Stars… And with Ghana threatening it seemed like the broken record was going to play one more time… but instead it was Ronaldo who finally found the back of the net and saved the US from elimination! Oh sweet irony… And that was it… the US lost a terribly uninteresting game against Klinsmann’s home nation and they were on to the round of 16!!! This was a time to celebrate but nobody was content with simply a birth into the knockout round- not the players, and certainly not the fans. Drawn into the Group of Death no one gave the US a chance. After losing 0-2 against Ukraine no one would have dreamed the US would have made it out of the group stage let alone had a chance to win their first two games… Yet, here they were. Against all odds. They had willed their way to a victory against Ghana even after losing their powerful striker Jozy Altidore. They had played their best soccer against Portugal putting two in the back of the net and doing enough to secure a point. And they had survived their final game against Germany. Now here they were in Salvador, Brazil… hungry for more. Yet, the team they faced had pace, quality and cleverness…. And they showed it. Anyone who watched the game will admit that the Belgians outplayed the US for 90 minutes and if it weren’t for the heroics of Tim Howard the Yanks would have easily lost two or three to nill. Regardless… With just seconds left before extra time the ball fell to the poacher, Wondolowski, just yards away from the goal with no one to beat but the keeper. His time to shine… This is what he does! He is the poacher! In the right place at the right time… WONDOLOWSKIIIII….. over the bar. To extra time we went. Just one goal…. just one goal… That’s what I kept saying. It just takes one goal… one moment of brilliance to make the difference. And it was one player who made the difference… Lukaku coming off the bench for Belgium… he gave the Beglians that little spark they needed to put the Americans away… and before a blink of an eye it was 2-0 Beglium. 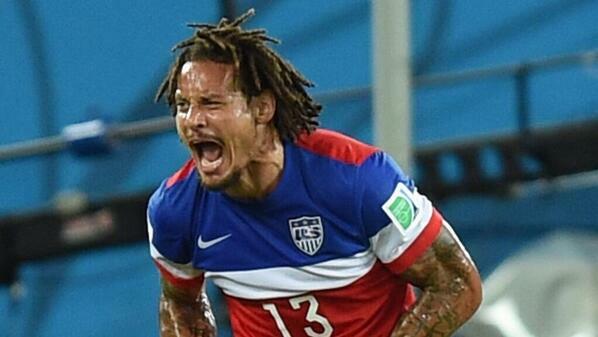 Yet, the game wouldn’t end before one more moment of brilliance for the Americans in Brazil. Off of his first touch, Julian Green finished a beautiful ball from Bradley chipped over the Belgian back line in the 110th minute!! 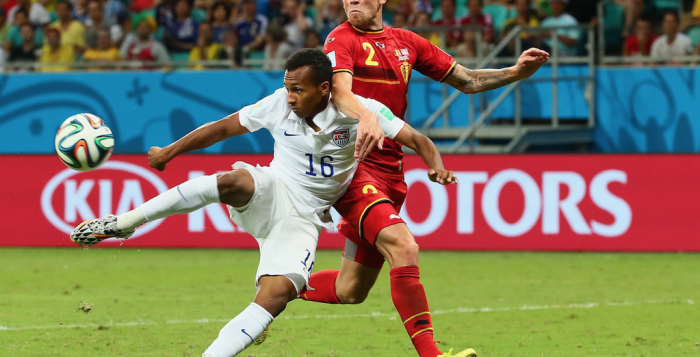 Julian Green scores a goal to bring the US within on with just minutes remaining in extra time. There was still time! For the next 10 minutes the US attacked and attacked and attacked! Michael Bradley was trying to will this team to victory and show Tim Howard that all of his saves had not gone to waste… Off a set piece with just minutes remaining the ball was played on the ground to Bradley who played it one time behind the wall to Dempsey!!! Can’t get to it in time… And that was the last chance the Americans would get. Whistle blows. 120 minutes. Game over. World Cup over. Certainly, I could write an entire essay lamenting on the missed opportunities. If Wondo would have just put away that last chance… If Bradley would have just played to his full potential…. If only Jozy didn’t go down in the first game…. Yet, although studying the past is the best way to to learn for the future, I’ll leave that for a later date (and another article)… For now, I’m just going to eat my Chic-fil-A, remember the best moments of this roller coaster ride and smile because, even it was just for a few weeks, my Americans peers got a great taste of the game I love. And now that they’ve got a taste… they’ll be back… maybe not tomorrow…. maybe not this year… but they’ll be back.